Intersdisciplinary open seminar organised by Occulto's editor and publisher Alice Cannavà in Berlin; its multiformat program — lectures, artist’s talks, performances, screenings, workshops, one-night exhibitions — brings together hard sciences, humanities and the arts. The inspiring theme of the session is the search and exploration of the fundamental, formal structure of a language, medium or discipline occurring in different fields of knowledge. As usual in The […] Experiment series, the chosen topic is an occasion to present concrete examples and tell stories about them. 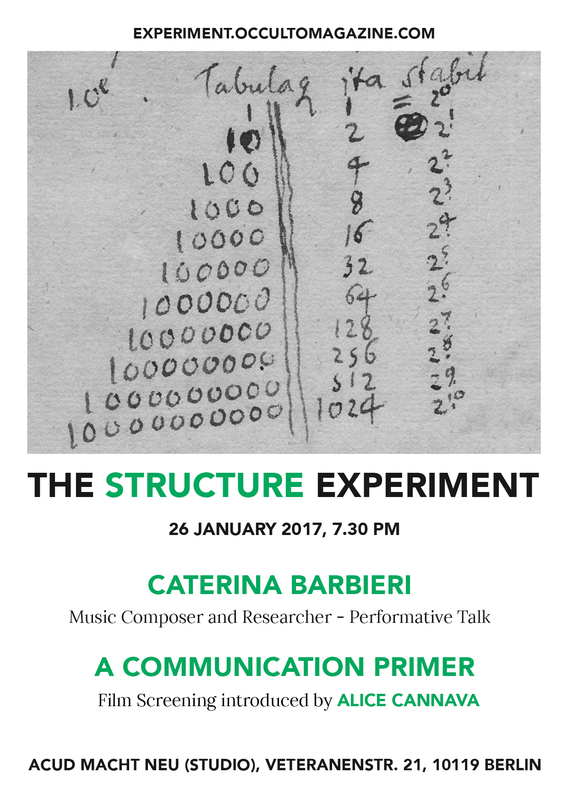 The first story comes from the present: Caterina Barbieri, Italian composer now based in Berlin, will talk about how her music practice is inspired by themes of emerging machine intelligence, human desire of pattern detection and the generative power of music. These are also the concepts at the core of her latest work Patterns of Consciousness (2017, Important Records). The second story comes from the past: it is the Communication Theory developed by Claude E. Shannon in the late 40s. Occulto Magazine editor Alice Cannava will introduce some aspects of the theory with a narrative approach before screening Charles & Ray Eames’ A Communication Primer, a 1953 educational yet incredibly poetic film about the theory. is an Italian composer now based in Berlin. Her work explores themes of machine intelligence and object oriented perception in sound through approaching music practice as an integrative cognitive feedback between humans and technology. After graduating at the Conservatory and the Faculty of Humanities in Bologna with projects focused on phenomenology of perception, philosophy of music and ethnomusicology, she has researched and produced music at the renowned EMS in Stockholm, where she has intensively composed for the Buchla 200 system. By means of synthesis, pattern based operations and subtractive counterpoint, her music draws severe geometries in time and space. A focus on minimalism in composition arises from a meditation on primary waveforms and exploration of the polyphonic and polyrhythmic potential of sequencers. Her work has been released on Important Records and performed in venues such as The Long Now, MaerzMusik and Atonal (DE), Norbergfestival (SE), Worm (NL), Angelica (IT), De Montfort University (UK), Manchester University (UK), EGH (IT). is an Italian, Berlin based independent publisher/curator and freelance designer/coder. She studied Fine Arts in Milan and Vienna. Since 2009 she edits, design and publish Occulto, a publication that explores natural and formal sciences and their history in connection to other fields and topics such as the visual arts, pseudoscience and history of religions. Since 2011 she’s curating in several Berlin venues – ACUD, WestGermany and Spektrum among others – a program of cultural events focused on experimental music research and audiovisual performances. Her edition Phantom Records – a series of graphic and textual artworks about a fictional music label – are part of the Deutsche Bank Collection Italy. She gave talks in venues and institutions such as Haus der Kulturen der Welt, Berlin; Università Ca’ Foscari, Venice; Central Saint Martins College of Arts & Design, London; Künstlerhaus, Halle für Kunst & Medien, Graz; Halle 14, Leipzig. Since 2016 she’s studying at the Technical University of Berlin (MA History and Culture of Science and Technology). series addresses and welcomes a very diverse public — scientists and artists, students and workers, all-round nerds and curious passers-by. Recurring lecturers and one-time guests will include hard and soft sciences researchers, historians and writers as well as visual artists, film directors, musicians and designers. Expect an informal situation, the possibility to develop a collective ongoing debate and collaborations, as well as good food and music. Fair-priced bar by ACUD. Music selection in-between and after. No smoking inside, spatious balcony for smokers. The space is accessible through stairs and elevator. Participants' registration is not mandatory but very appreciated!